I have unearthed many a gem in her store, usually sold for a song–a heavy pitcher winking with bright red roses, a set of six, flared champagne coupes. I particularly loved a juice glass, mottled with ivory and canary yellow flowers. It was a small but distinct pleasure–to fill that glass and watch the flowers pop. The holiday season ended, and the Frenchman and I were poised to fall back into our regular routine. Sunday night, we rode our bikes to dinner. By candlelight, we ate pizza and drank wine. We came home. I sank into the couch and flipped open my computer, while he moved to the sink to wash a couple of lingering dishes. Normal, normal. And then–I heard a loud thud, followed by the clear chirp of glass breaking into so many pieces it might as well have fallen back into sand. A moment of suspended silence, and then pain, but pain washed with panic. Have you ever heard a noise like that come from someone you love? I crossed to the sink, and there was my flowered glass, broken into uncountable pieces. I looked at the Frenchman’s hand, at his fingers. We careened to the bathroom sink and I turned on the tap. I did the best I could. There was a flurry of paper towels, a few hasty swipes of Neosporin, and we were out the door, into the freezing night. Surgery was arranged for the next day. We were last on the docket. Again we waited and waited. It was a rainy day, the fog uncharacteristically thick and hovering low to the ground. We sat on ugly chairs, and watched the room empty around us. The Frenchman’s surgery was scheduled to last 90 minutes, but I was told it could be as short as an hour. And so, after he was brought into the OR, I walked through the misty rain to fill his prescriptions, and was back in my chair by the 60-minute mark. But 60 minutes came and went. And then 90, and then another 15 minutes passed, and then another. I was alone in the waiting room by this point, and the television was on, loud. A panel of “gossip experts” sat around a table, smirking smugly, debating the advisability of this celebutante or that’s latest romantic dalliance. In those final 30 minutes, I succumbed to an intense nervousness; finally, my single-minded focus on finding and executing a solution was cracking. Where was he, and why was this taking so long? As I waited, the television program made me angry and angrier–here I was, panicking, aware of my whole self, my whole beating heart, and simultaneously birdbrains were permitted on television, paid to spin pettiness into gold. The doctor came into the waiting room just at the two-hour mark. He smiled, and I felt perhaps the truest sense of relief I have ever felt–pure and undistilled. There would be pain, yes, and recovery, and three months of rehabilitation, but the surgery had been successful, and eventually, he would be all right. I understand that what happened to the Frenchman, while difficult and trying for us both, was a blip of nothing compared to what others have experienced. I know how lucky we are, really. It would be lying to say that this story ends after his surgery, though–recovery is a long, frustrating, and thoroughly unglamorous process. We are still figuring out how to adjust. Day by day, it gets a hair easier. When we returned home that first morning, after our trip to the ER, the first thing I did was clean the glass from the sink. The black sky outside the window was just starting to hint midnight blue. I stood at the sink; bone tired, and pulled a million shards of ivory and canary yellow glass into our trashcan. Trying experiences, if anything, reveal to us what is most important, what is essential. The Frenchman–my love, my great love; he is essential. He is what I could never do without. I knew this before, of course, but now I have context. Now I have been tested, with something at stake. We are fragile beings, but if I must know and understand this, at least I can take solace in another knowledge–that our love is not subject to this same fragility. It is industrial-strength, our love. It is buoying, good for all weather. It’s everything, really. 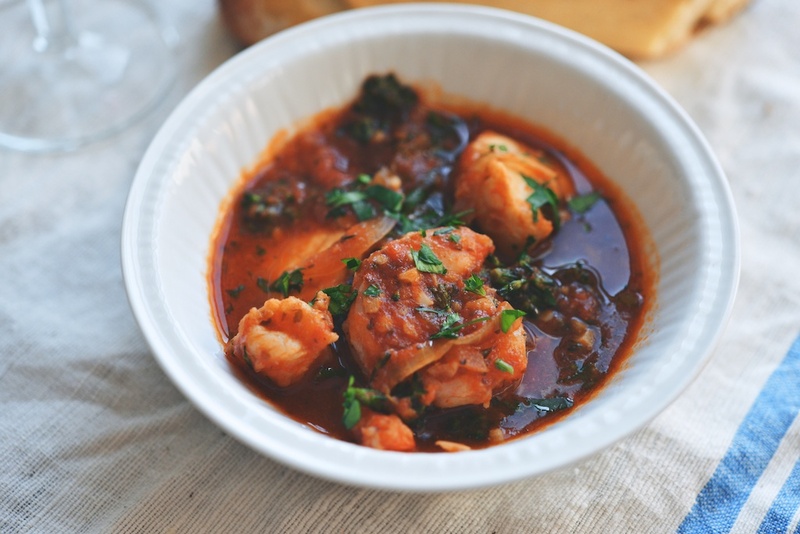 This recipe is loosely based on Bon Appétit‎’s Flounder Poached in Fennel-Tomato Sauce, a dish that is easy enough for a weeknight, but pretty enough to serve (and impress) guests. My version, too, is comforting and fortifying against the cold, but not at all heavy. 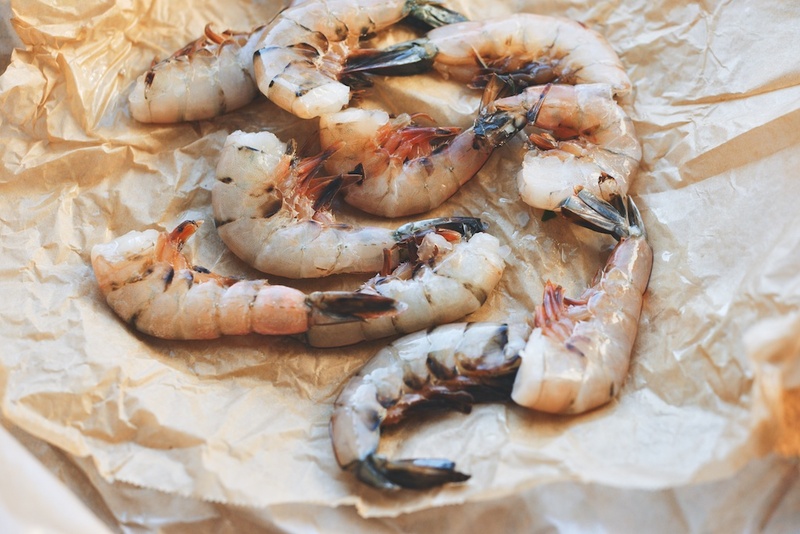 My suggestion is to use the very best seafood you can source–for me, that means whatever the fishmonger currently has in rotation at the farmers market. 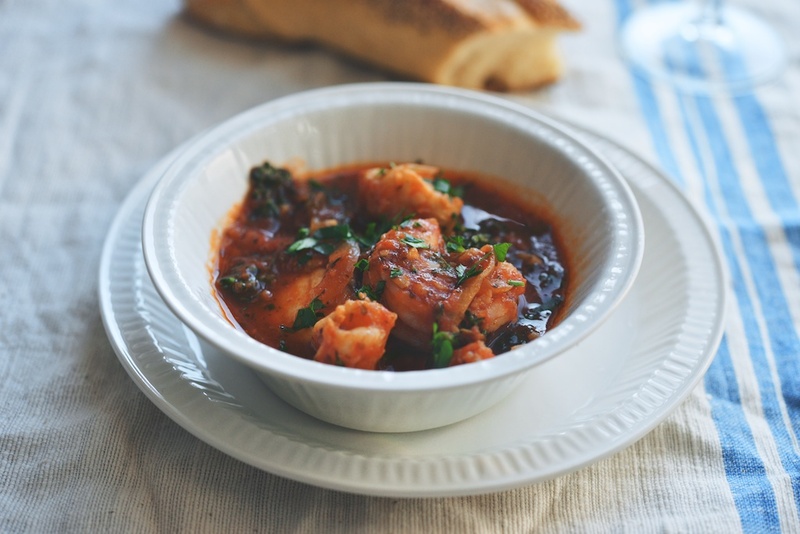 (This recipe is adaptable, so feel free to use the seafood you prefer.) 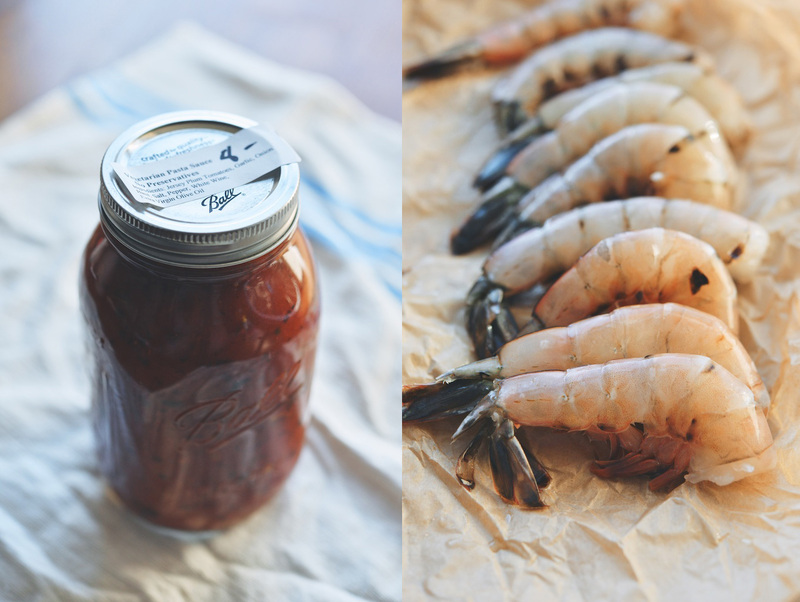 Use your favorite simple tomato sauce; I love the marinara from Central Valley Farm. The longest part of this recipe is sautéing all the vegetables, which you can do up to a day ahead, if you want. To make the dish even more substantial, feel free to add other cooked vegetables like carrots, fennel, potatoes, or dark greens; or white beans or chickpeas. Serves 4. Heat 2 tablespoons of the olive oil in a Dutch oven over medium heat. Add the sliced onion, and cook until soft and golden, about 20 minutes. (I typically add splashes of water to the pan as I go, to prevent the onions from burning.) Set the onions aside in a bowl. And another tablespoon of olive oil to the pan, and simmer the garlic; this should only take 45 seconds-1 minute. 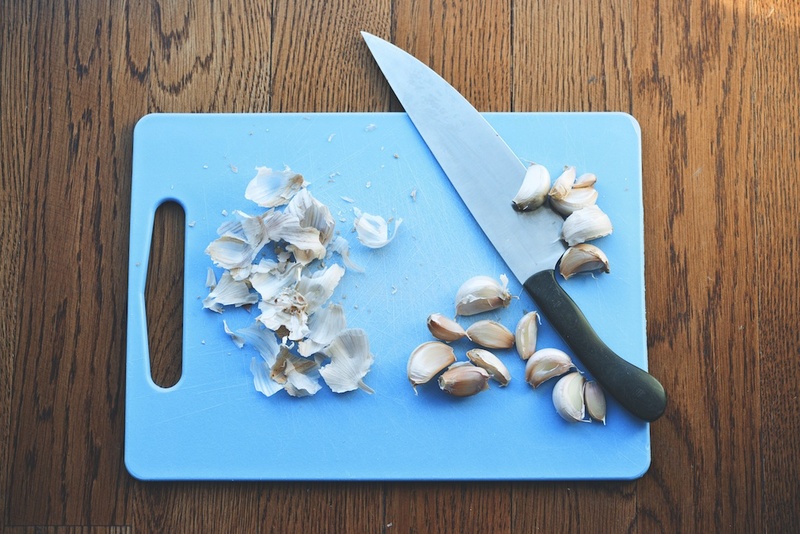 Wait until the garlic is fragrant, but not browned. 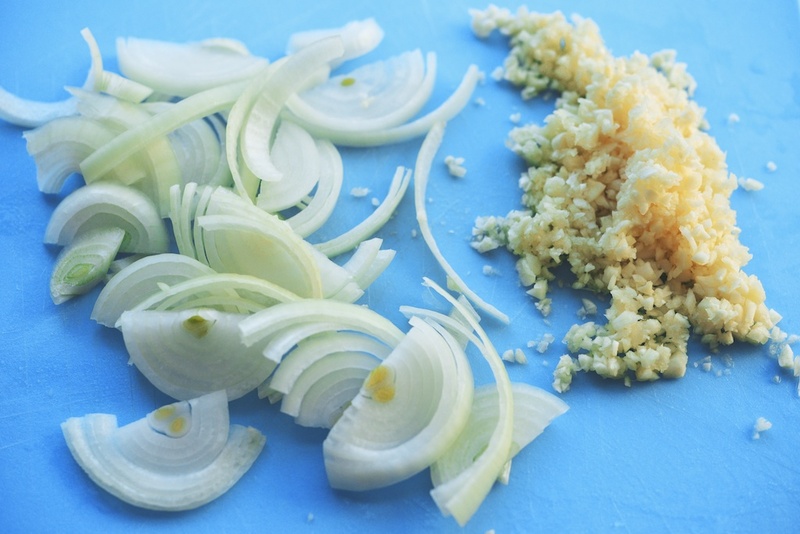 Remove the garlic to the same bowl as the onions. Finally, add the remaining 2 tablespoons of olive oil to the pan, along with 1/4 teaspoon red pepper flakes, and a splash of water. 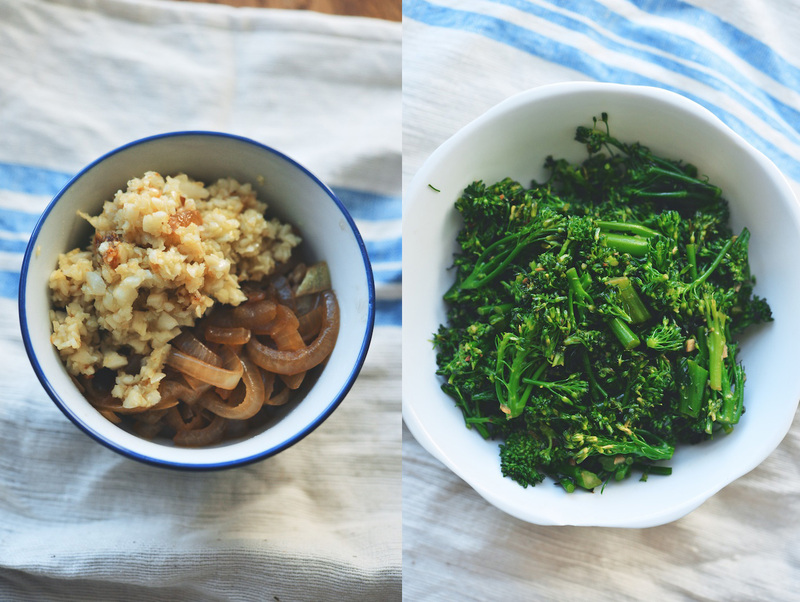 Cook the broccolini until it is tender, but still bright, about 3-5 minutes. 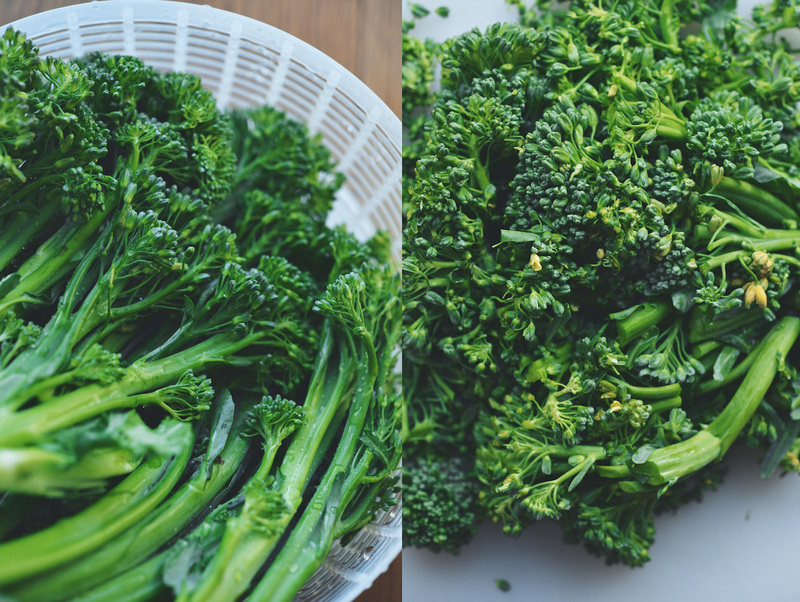 Remove the broccolini to a separate bowl. In the same Dutch oven you used to cook the vegetables, heat the tomato sauce over medium-low heat. Add the onions, garlic, fennel seeds, as well as the remaining red pepper flakes. Allow the sauce to simmer together for 5-10 minutes. Turn the heat to low. 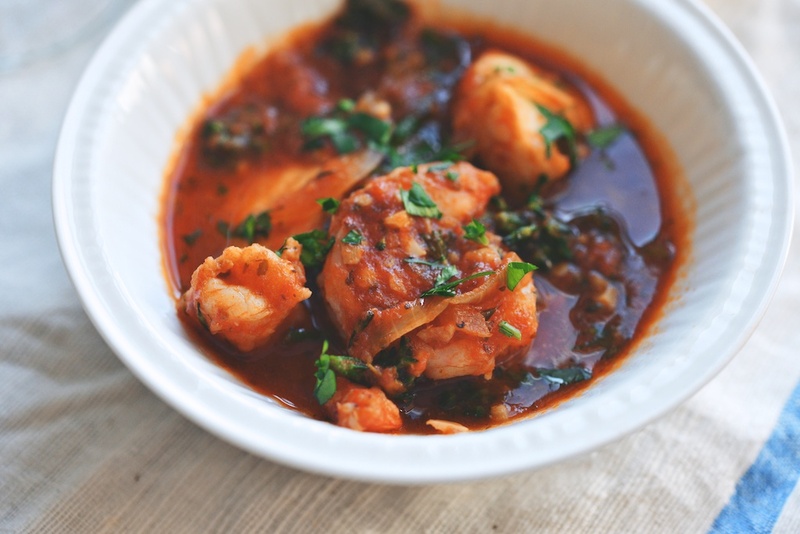 Add the shrimp and the monkfish pieces to the sauce, arranging them so that the fish is at least halfway submerged in the sauce. Put the lid on, and allow the fish to cook for 12-14 minutes, or until the shrimp and fish are just cooked through. 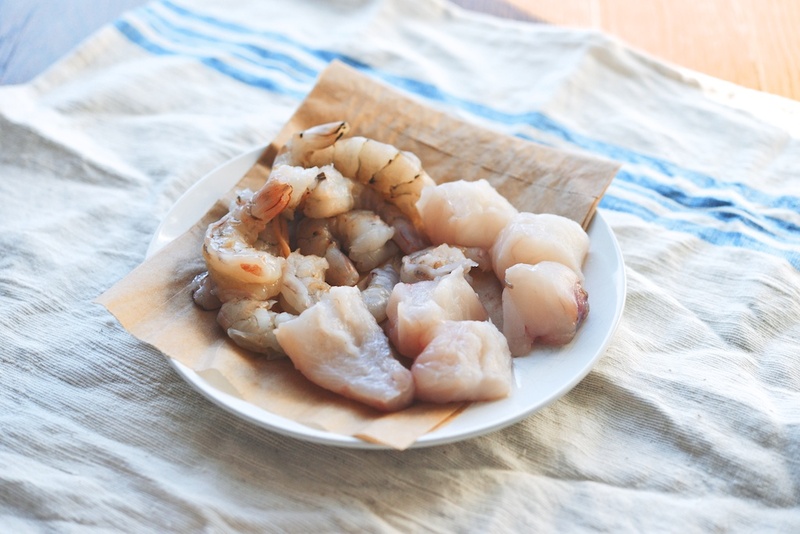 (Keep in mind that the fish and shrimp will continue cooking, even after you turn off the heat.) Stir the broccolini into the pot. Adjust the salt, to taste. 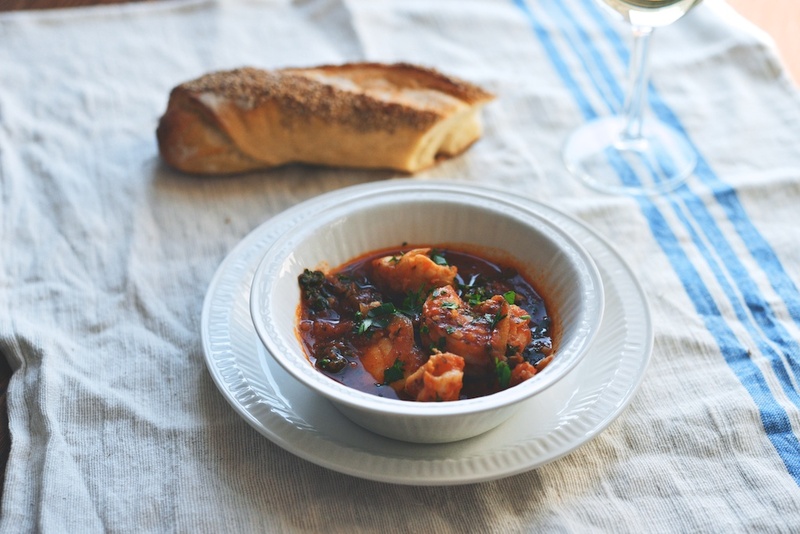 Serve the stew in warm bowls, topped with the chopped parsley, and alongside a good crusty baguette for sopping up all the tomato sauce. What a beautiful account of a very stressful situation! 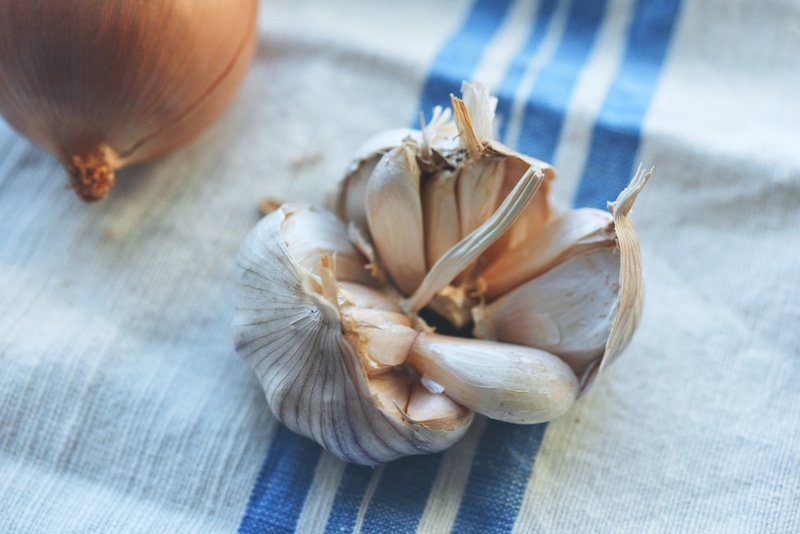 Ah Cristina, your writing is as rich and alive as your recipes and your beautiful blog. 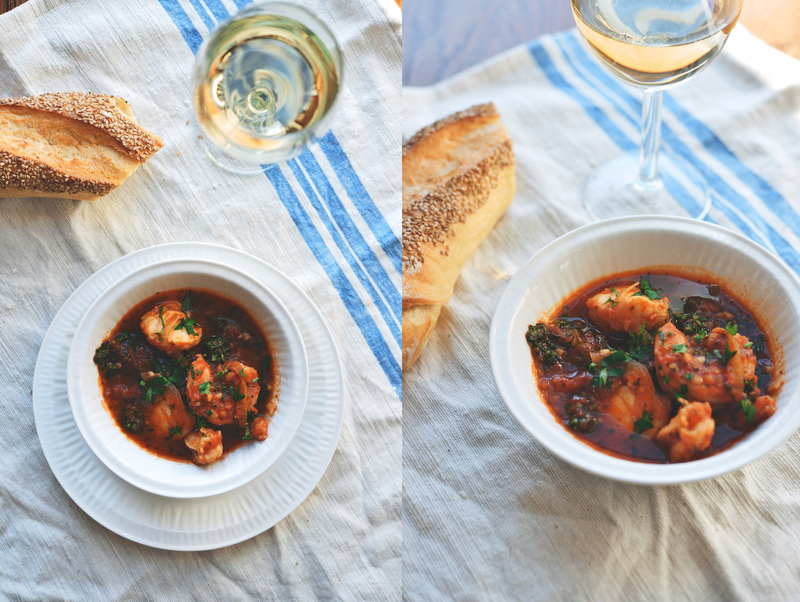 I must echo Donnas words, and what a perfect dish for these wintery days! Lovely vegetables you got there, paired with shrimps and organic spices. Surely, that looks perfect for a cold day. Healthy and rich in flavor! You tell the story so well. Having had a similar event waiting for my wife to come out of the O.R. way late I can feel what you went through and relate completely. I can only hope and try to be half the writer you are someday. Until then I will just keep plugging along and reading great blogs like yours. Nice pics too!